We are pleased to celebrate 10 years of our Fishing for Energy partnership! This public-private partnership is a collaboration between the NOAA Marine Debris Program, the National Fish and Wildlife Foundation, Covanta, and Schnitzer Steel Industries that prevents and reduces the impacts of derelict fishing gear on the marine environment. Modeled after Hawaii’s Nets to Energy program, the partnership installs collection bins that provide the fishing community with a no-cost option for disposing of old or unwanted gear. The old nets, line, and ropes are then converted into energy. A lot has been accomplished since the first collection bin was placed in the Port of New Bedford, MA in 2008. 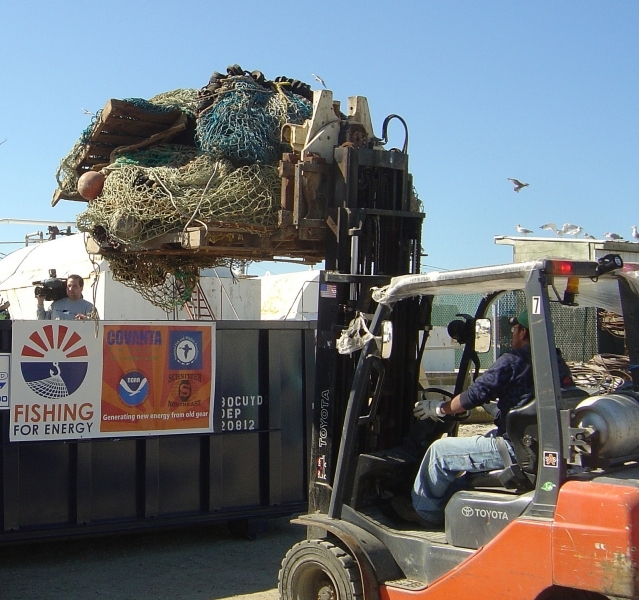 Over the last 10 years, the Fishing for Energy partnership has grown to provide removal services at 55 ports in 12 states, collecting nearly 4 million pounds of fishing gear. Gear collected at these ports is first sorted at Schnitzer Steel Industries for metals recycling, and the remaining non-recyclable plastic material is processed and converted into energy at Covanta Energy locations. Why is this important? Derelict fishing gear is a big marine debris problem. Derelict gear like nets, traps and lines, when left in the marine environment, can continue to trap, entangle, and potentially kill marine life like crabs, fish, sea lions, and sea turtles, smother fragile habitats like coral reefs and seagrass beds, and act as a hazard to navigation for fishing and recreational vessels. The Fishing for Energy partnership prevents this gear from taking up precious landfill space or harming the marine environment, and serves as an innovative solution to address this global problem. As we look ahead to 2019, we are excited to see what the future holds as we continue to work to keep the sea free of debris!